Large-scale storage of low-pressure, gaseous hydrogen in salt caverns and other underground sites for transportation fuel and grid-scale energy applications offers several advantages over above-ground storage, says a recent Sandia National Laboratories study sponsored by the Department of Energy's Fuel Cell Technologies Office. 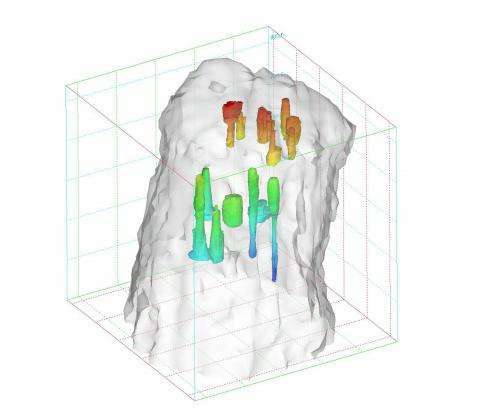 Geologic storage of hydrogen gas could make it possible to produce and distribute large quantities of hydrogen fuel for the growing fuel cell electric vehicle market, the researchers concluded. Geologic storage solutions can service a number of key hydrogen markets since "costs are more influenced by the geology available rather than the size of the hydrogen market demand," said Sandia's Anna Snider Lord, the study's principal investigator. The work, Lord said, could provide a roadmap for further research and demonstration activities, such as an examination of environmental issues and geologic formations in major metropolitan areas that can hold gas. Researchers could then determine whether hydrogen gas mixes with residual gas or oil, reacts with minerals in the surrounding rock or poses any environmental concerns. Should the market demands for hydrogen fuel increase with the introduction of fuel cell electric vehicles, the U.S. will need to produce and store large amounts of cost-effective hydrogen from domestic energy sources, such as natural gas, solar and wind, said Daniel Dedrick, Sandia hydrogen program manager. As Toyota, General Motors, Hyundai and others move ahead with plans to develop and sell or lease hydrogen fuel cell electric vehicles, practical storage of hydrogen fuel at large scale is necessary to enable widespread hydrogen-powered transportation infrastructure. Such storage options, Dedrick said, are needed to realize the full potential of hydrogen for transportation. Additionally, installation of electrolyzer systems on electrical grids for power-to-gas applications, which integrate renewable energy, grid services and energy storage will require large-capacity, cost-effective hydrogen storage. Storage above ground requires tanks, which cost three to five times more than geologic storage, Lord said. In addition to cost savings, underground storage of hydrogen gas offers advantages in volume. "Above-ground tanks can't even begin to match the amount of hydrogen gas that can be stored underground," she said. The massive quantities of hydrogen that are stored in geologic features can subsequently be distributed as a high-pressure gas or liquid to supply hydrogen fuel markets. While geologic storage may prove to be a viable option, several issues need to be explored, said Lord, including permeability of various geologic formations. A geologist in Sandia's geotechnology and engineering group, Lord for years has been involved in the geologic storage of the U.S. Strategic Petroleum Reserve, the world's largest emergency supply of crude oil. For her study on geologic storage, Lord and her colleagues analyzed and reworked the geologic storage module of Argonne National Laboratory's Hydrogen Delivery Scenario Analysis Model. To help refine the model, Lord studied storing hydrogen in salt caverns to meet peak summer driving demand for four cities: Los Angeles, Houston, Pittsburgh and Detroit. She determined that 10 percent above the average daily demand for 120 days should be stored. She then modeled how much hydrogen each city would need if hydrogen met 10, 25 and 100 percent of its driving fuel needs. Los Angeles has three times the population of Detroit and more than six and a half times the population of Pittsburgh, but the nearest salt formations are in Arizona, so Lord included the cost of getting the stored hydrogen from Arizona to Los Angeles. Even so, Los Angeles' modeled costs are significantly less than those for Detroit and Pittsburgh. Salt formations in Arizona are thicker than those for Detroit and Pittsburgh, with larger and fewer caverns. Houston has the best conditions of the four cities because the Gulf Coast offers large, deep salt formations. To examine the cost of geologic hydrogen storage, Lord started by selecting geologic formations that currently store natural gas. Working with Sandia economist Peter Kobos, Lord analyzed costs to store hydrogen gas in depleted oil and gas reservoirs, aquifers, salt caverns and hard rock caverns. Their paper, "Geologic storage of hydrogen: Scaling up to meet city transportation demands," was published in the International Journal of Hydrogen Energy. Other fuels are already stored geologically. Oil from the Strategic Petroleum Reserve, for example, is held in large man-made caverns along the Gulf Coast. Natural gas is stored in more than 400 geologic sites to meet winter heating demands. Lord envisions that excess hydrogen produced throughout the year could be brought to geologic storage sites and then piped to cities during the summer, when the demand for driving fuels peaks. Depleted oil and gas reservoirs and aquifers initially seem the most economically attractive options, she said. "Just looking at numbers, because they can hold such a larger volume relative to any cavern you create, they look cheaper," she said. But hydrogen gas is a challenging substance to store. "Because it's a smaller molecule than methane, for example, it has the potential to leak easier and move faster through the rock," Lord said. Depleted oil and gas reservoirs and aquifers could leak hydrogen, and cycling – filling a storage site, pulling hydrogen out for use and refilling the site – can't be done more than once or twice a year to preserve the integrity of the rock formation, Lord said. With a salt cavern or hard rock cavern, "there are no permeability issues, there's really no way anything can leak," she said. "You can bring more product in and out, and that will, in the long run, decrease your costs." Hard rock caverns are relatively unproven; only one site holds natural gas. But salt caverns, which are created 1,000 to 6,000 feet below ground by drilling wells in salt formations, pumping in undersaturated water to dissolve the salt, then pumping out the resulting brine, are used more extensively and already store hydrogen on a limited scale, Lord said. Lord said her work could lead to demonstration projects to further cement the viability of underground hydrogen storage. Salt caverns are the logical choice for a pilot project due to their proven ability to hold hydrogen, she said. Environmental concerns such as contamination could also be further analyzed. However, salt formations are limited. None exist in the Pacific Northwest, much of the East Coast and much of the South, except for the Gulf Coast area. Other options are needed for development of a nationwide hydrogen storage system. More information: "Scaling up to meet city transportation demands," International Journal of Hydrogen Energy, Volume 39, Issue 28, 23 September 2014, Pages 15570-15582, ISSN 0360-3199, dx.doi.org/10.1016/j.ijhydene.2014.07.121.